U.S. Army gunners from Archer Battery, 2nd Platoon, 4th Section, Field Artillery Squadron, 2nd Cavalry Regiment carry out a mission on the M777 howitzer. 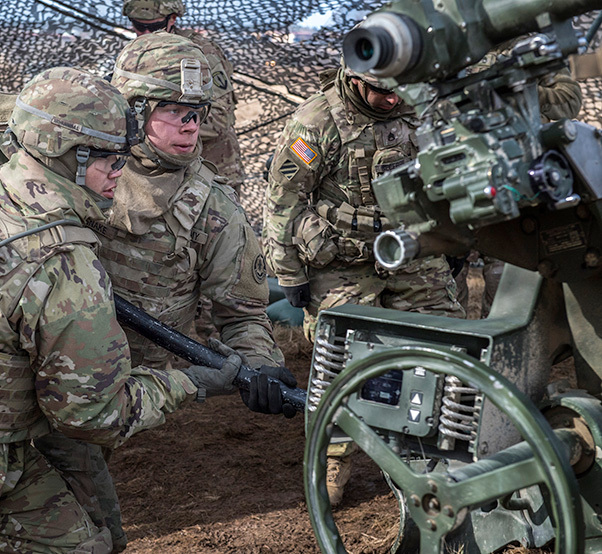 The 2nd Cavalry Regiment is providing feedback on prototypes, including mounted and dismounted electronic warfare capabilities they were fielded in February. Recently Electronic Warfare Officers from the 2CR came from Europe to participate in a simulation experiment in McLean, Va. to evaluate the operational value of the capabilities. An adversary is spotted positioning fighters along the border of an ally nation. As U.S. Army forces are quickly deployed, one unit is under special instructions: detect and survey the adversary’s electronic warfare jammers and emitters. As vital as this information is for the commander’s situational awareness, a few months ago mapping out the electromagnetic spectrum would have been much more difficult. While only a simulated experiment, the realism of this scenario reflects how the Electronic Warfare Officers of the 2nd Cavalry Regiment must operate to ensure freedom of maneuver for ground forces. To help them do this, the Army recently rolled out its initial set of EW capabilities for brigade and below, giving Soldiers at the lowest echelons operating in a contested environment the ability to detect, identify and locate targets within the electromagnetic spectrum. Now, just a few months after the 2nd Cavalry Regiment and other Europe-based units received the integrated package of mounted, dismounted, and command and control EW capabilities, a small group of EWOs traveled to the U.S. to see the next phase of upgrades, participate in simulated scenarios based on potential real-world missions, and provide feedback on how they would fight with the new systems. The simulation experiment, or SIMEX, helps the Army evaluate the operational value of the capabilities by determining whether the operators can accomplish the mission under the scenario-based exercise. 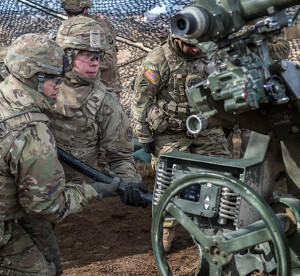 Delivered in response to an Operational Needs Statement from U.S. Army Europe, the technologies are interim solutions designed as a bridge to enduring EW programs of record that are still in development. 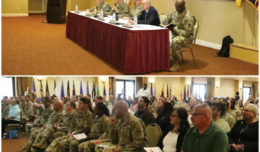 The Army Rapid Capabilities Office and the Project Manager for Electronic Warfare & Cyber teamed with 2nd Cavalry Regiment and other receiving units on a rapid prototyping approach to shape system design, performance, functionality and training to meet operational needs in the near- and mid-term. The 2nd Cavalry Regiment EWOs came from Europe to take part in a two week-long SIMEX, designed to help improve operational understanding and effectiveness of the EW prototypes. 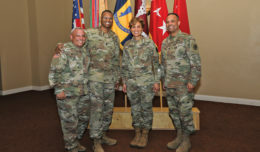 The event played out in a MITRE lab in McLean, Virginia, which accommodates over 50 personnel representing the operational roles of “blue” or friendly forces, and “red” or enemy forces. The SIMEX lab provides the appropriate computer infrastructure to conduct simulation experiments with real military Command, Control, Communications, Computers, Intelligence, Surveillance and Reconnaissance, or C4ISR, systems. This experiment allowed the 2nd Cavalry Regiment EWOs to use their newly fielded capabilities in various operationally relevant scenarios in order to identify best tactics, techniques and procedures. The event brought together in one room the Soldiers who use the capabilities, the engineers who are designing them, the project manager responsible for fielding the program of record solution, and the RCO team delivering the interim prototypes. Sgt. 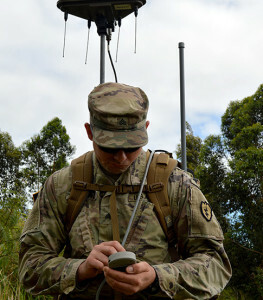 Jessie Albert, an electronic warfare specialist assigned to 2nd Battalion, 35th Infantry Regiment, 3rd Brigade Combat Team, 25th Infantry Division, trains on the Wolfhound Radio Direction Finding System at Schofield Barracks, Hawaii, on April 11, 2018. 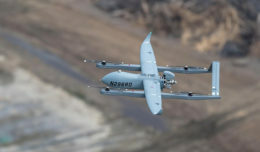 One scenario required the EWOs to detect communications between enemy forces’ headquarters and insurgents, then send an Unmanned Aerial Vehicle to confirm. Other scenarios involved detecting enemy jammers, networks and UAV communications; determining if a report that their network is being jammed is real or false; and intercepting, detecting, identifying and locating the source of interference that is affecting their communications. By the end of the SIMEX, which concluded May 4, the Soldiers were becoming experts at utilizing their new kit of capabilities in order to command the electromagnetic spectrum. With the engineers and operators working side by side, some of the suggested changes were made over lunch or by the next morning. Flory agreed, adding that the experiment also provided valuable training experience. The Soldiers also evaluated some new capabilities their fielded prototypes currently don’t have, in order to inform whether future iterations of the EW prototypes or programs of record should include added features, such as a sensor that provides a potentially wider and clearer image of the electromagnetic environment, and improved signal identification. Some software updates to the fielded systems are already on track to be delivered this summer, with additional “Phase 2” upgrades to the prototypes expected throughout 2018 and 2019.